Go to original pattern for design DROPS 42-2. 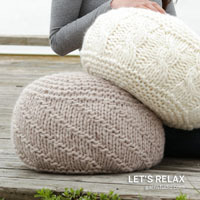 You can get the yarn to make this pattern from	72.00$. Read more. 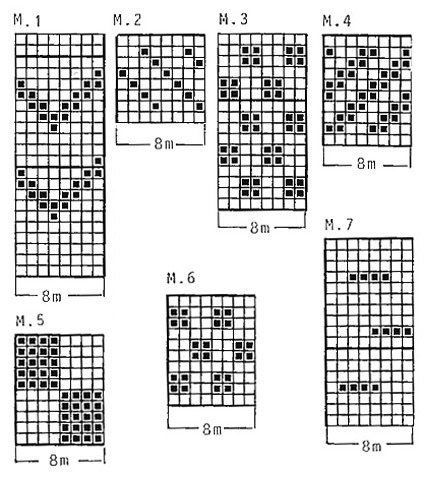 Knitting gauge: 15 sts x 18 rows on needle size 6 mm / US 10 in pattern with double thread Muskat = 10 x 10 cm / 4'' x 4''. *5 rows stockinette st with rust/brown, chart M.1 with rust/wine red, 4 rows stockinette st with dark brown/brown, M.2 with rust/mustard, 4 rows stockinette st with wine red/mustard, M.3 with rust/brown, 8 rows stockinette st with dark brown/wine red, M.4 with brown/wine red, 6 rows stockinette st with dark brown/brown, M.5 with rust/mustard, 8 rows with brown/mustard, M.6 with rust/wine red, 6 rows stockinette st with rust/mustard and M.7 with dark brown/wine red*. Repeat from *-*. 2nd row: P over K, K over P.
Short version: Cast on 10 less sts and inc a further 10 sts after the seed st edge = 168-176-184 sts. 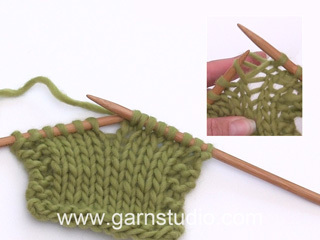 Dec measurements by armhole, neckline and bind off by 21-23-25 cm. Finished measurements = 53-54-55 cm. Pick up approx 20 less sts on front piece edges and only make 5 buttonholes. Reduce materials by 50 g mustard, rust and wine red for all sizes and 50 g brown and dark brown for the two larger sizes. Knitted back and forth on circular needle from mid front with 1 thread of each color as described under Pattern. Cast on 168-176-184 sts on circular needle size 5 mm / US 8 with dark brown/wine red and work 3 cm / 1 1/8'' seed st.
Change to needle size 6 mm / US 10 and work 1 row stockinette st. Continue in pattern as described above. Remember your knitting gauge. When piece measures 51-53-56 cm work next row as follows: 40-42-44 sts = front piece, bind off 4 sts for armhole, 80-84-88 sts = back piece, bind off 4 sts for armhole, 40-42-44 sts = front piece. Now complete each piece separately. 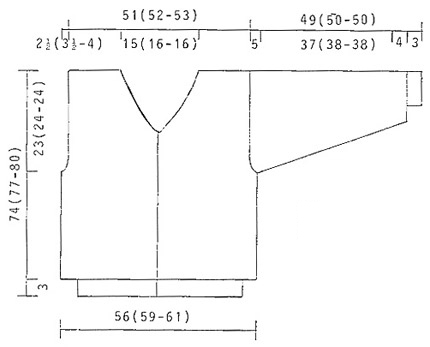 Right front piece: = 40-42-44 sts. 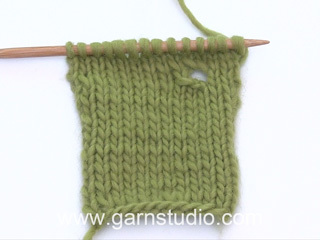 Bind off to shape the armhole on every other row: 2 sts 1-1-1 time and 1 st 0-1-2 rimes = 38-39-40 sts. When piece measures 58-59-62 cm bind off to shape the neckline on every other row: 2 sts 3-3-3 times and on every 4th row 1 st 5-6-6 times. Bind off remaining sts when piece measures 74-77-80 cm. Back piece: = 80-84-88 sts. 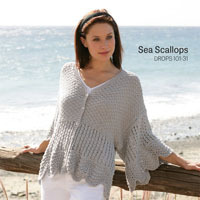 Dec to shape the armhole as described for front piece = 76-78-80 sts. When piece measures 72-75-78 cm bind off the middle 18-20-20 sts for neck and dec 2 sts on neckline on next row. 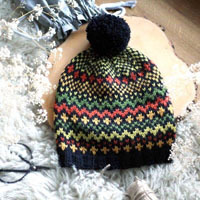 Knitted round on double pointed needles. Cast on 36-36-36 sts on needle size 5 mm / US 8 with dark brown/wine red and work 3 cm / 1 1/8'' seed st.
Change to needle size 6 mm / US 10, knit 1 round stockinette st and continue in pattern. When piece measures 7-7-7 cm inc 2 sts mid under arm on every 3rd and 4th round alternately a total of 17-18-18 times = 70-72-72 sts. When piece measures 44-45-45 cm bind off 6 sts mid under arm and finish the sleeve back and forth on needle. Bind off for sleeve cap each side on every other row: 5 sts 4 times for all sizes. 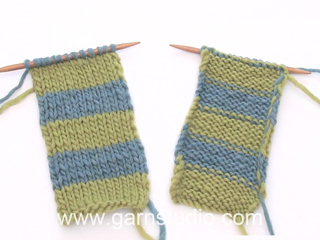 Bind off, sleeve measures approx 49-50-50 cm. Join shoulders. 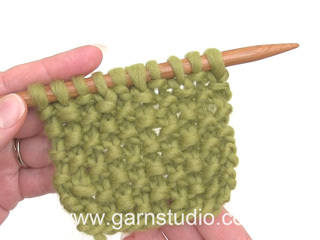 Pick up approx 100 to 105 sts along left front piece on needle size 5 mm / US 8 with rust/wine red and work 3 cm / 1 1/8'' seed st back and forth on needle, change to dark brown/wine red and work 1 row seed st, bind off. Repeat along right front piece, but after 1 cm / 3/8'' make 8 buttonholes evenly distributed on row. 1 buttonhole = bind off 2 sts and cast on 2 new sts on return row. 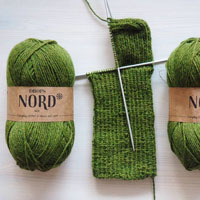 Pick up approx 100 to 110 sts round the neckline on needle size 5 mm / US 8 with rust/wine red and work 2 cm / 3/4'' seed st back and forth on needle, change to dark brown/wine red and work 1 row seed st, bind off. Set in sleeves and sew on buttons. Kan dere skaffe Muskat i fargenr. 28 -brun og fargenr. 35 -sennep. Finner de ikke på fargekartet i nettbutikken. Hei Åse. Disse to farver er desvaerre udgaaet, men du kan finde alternativer paa vores farvekort - se her. Geachte dames,Heren, Bij dit patroon is geen telpatroon. Hoe kan ik dat krijgen?